What is known about last week’s violence in which more than 100 people, many of them children, were killed? Where did the massacre occur? 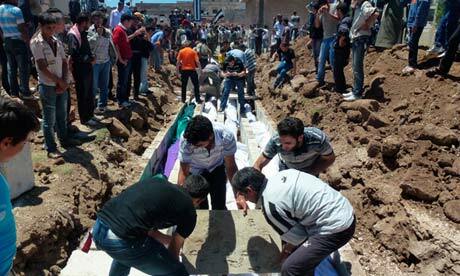 It took place in the town of Houla, which is in the western province of Homs in central Syria. Most of the dead were in the village of Taldou, which is 1km south-east of Houla. Homs is the most restive of Syria’s 10 provinces and has become one of two main hubs of the nationwide uprising. It has a large Sunni majority as well as numerous Allawite areas, which have remained staunchly loyal to the Syrian regime. Both sides live in close proximity in many areas. Shelling of Houla and Taldou started around 3pm on Friday afternoon, several hours after regular weekly anti-regime demonstrations, according to the accounts of numerous locals. Several residents started sending out appeals for help over Skype around that time. The UN monitoring team was contacted late on Friday afternoon. There are credible reports that members of the Free Syria Army attacked a regime checkpoint around the same time that firing started on Houla. The reports come from two local men, one of whom is the head of the Syrian Revolutionary Council in Houla. The situation quickly escalated, with artillery and tank shells used to barrage the town for close to three hours. Houla and Taldou are both home to large numbers of defectors and their families. From the early evening, militias entered both areas from outlying villages. Several witnesses and survivors of the ensuing massacre say the militias arrived first on foot, then later in tanks. An 11-year-old boy interviewed by the Guardian said he saw men get out of an armoured vehicle in front of his house. He says the men entered his home and killed his family. The attack on the towns continued until dawn. What are the competing theories? The residents of Houla are emphatic that the killers were members of the pro-regime militia, al-Shabiha (which is Arabic for ghosts), who are drawn almost exclusively from the Allawite sect. The Shabiha have been at the vanguard of the regime crackdown and are valued by the Syrian military for their unwavering loyalty. The UN has said that up to 49 of the 100-plus victims were children and a further 20 were women. The toll of non-fighters is unusually high, something that locals say points to a particular hatred towards them. Locals say it’s insulting to them for people to blame residents of the town for killing their own families, as some supporters of the Assad regime have done. Abu Jaffour, a town elder said: “There are no such people here. There never have been and will not be in future. It is a big lie.” They insist that there are no outsiders among them and that the attackers came from the direction of the loyalist villages, especially Foulah and Qabou. The regime has instead blamed “armed terrorists,” a refrain it has stuck to throughout the 15-month uprising. It suggests jihadists from Libya, Iraq and Afghanistan have entered Syria and overtaken the uprising. Damascus has said it would display foreign fighters captured in Syria, including at least one Briton, but it has not yet done so. What is the significance of the surrounding villages? Houla is surrounded on three fronts by Allawite villages, Foulah, al-Qabou, Shenya and Sharqliah. Assad is an Allawite and so are almost all of the core of the Syrian regime. Locals say that Foulah and al-Qabou have long been hostile to Houla. They claim the hostility has increased as the uprising has raged. Survivors have testified that the militiamen spoke with an Allawite dialect. What does the available evidence say about the perpetrators? Witnesses say some of the men were wearing at least partial military uniform. Some were in civilian clothes. Only the regime army has the ability to shell areas for a long period. There is strong evidence that shelling did take place in the late afternoon of Friday. This is supported by videos believed to have been taken during the attack and by pleas for help from locals sent as shells were falling. Locals scorn the idea that jihadists from al-Qaida are among them. They say that none have come to them, and nor would they be welcome. They say that it would be culturally impossible for al-Qaida to be among them without them knowing. They say that just is unlikely is the regime line that the al-Qaida attackers approached from the town’s outskirts – areas that regime forces fully control. Survivors say that the men who killed their families were Allawites, some of them from nearby villages, especially Foulah and Qabou. They claim that several openly acknowledged where they were from and why they had come. I must, at last, admit defeat. I simply have no words, no rhetorical ammunition, no conceptual frameworks that could adequately address the total moral nullity exposed in Monday’s New York Times article on the death squad that Barack Obama is personally directing from the White House. (“Secret ‘Kill List’ Proves a Test of Obama’s Principles and Will.”)It is not so much a newspaper story as a love letter — a love letter to death, to the awe-inspiring and fear-inducing power of death, as personified by Barack Obama in his temporary role as the manager of a ruthless, lawless imperial state. In the cringing obsequiousness of the multitude of insiders and sycophants who march in goose-step through the story, we can see the awe and fear — indeed, the worship — of death-dealing power. This enthrallment permeates the story, both in the words of the cringers and in the giddy thrill the writers display in gaining such delicious access to the inner sanctum. Of course, he was an evil man without any sense of moral responsibility at all. In our much more enlightened times, under the guidance of a Nobel Peace Prize Laureate in the White House, we are so much wiser, so much better. We say: “A certain amount of screw-ups are going to happen.” Isn’t that much more nuanced? Isn’t that much more moral?